Nico and I fished the WON Bass team tourney on a whim today. Haven't been out there since last year, but post spawn is usually good for some bites and action there. Being a 6 hour event on fathers day worked out great. Blast off 5:45 - we headed in to Franks and chucked around. Had short strikes on buzzbait and swimbait, they seemed tiny. Nico caught a 2 pounder on a chatterbait. We ran on down the old Delta and looked around up shallow to see if anything was to be seen. Lots of fry but no bass on beds. Nico tried punching the mats with a big weight and a brush hog and got bit right away. Before I could get rigged up with the right stuff he put a limit in the boat for around 12 or 13 pounds. It was 8:15am. We continued on doing this for the next few hours and caught another 5 or 6 fish. I got one on a reaper that went 3.85. All the fish were spawned out and tired looking. Nico only had two of the good weights, and lost one to your typical braided line breakoff (for no reason at all). He used 2 weights after that and let me keep the other good weight. It was fairly hilarious. As the tide went out (minus tide today) there was no more water under the mats so we ran around trying frogs and swimbaits and senkos. Didn't catch any doing that. Weighed 15.69lbs and took 4th place. Surprising. I guess the bite is bad at the delta this year. It’s 6:30 Thursday morning and Tong, Tim and I launch out of Russo’s Marina. We make a 15-minute run south and fish the mouth of a dead end slough near Orwood. The tide had just peaked and started to push out. Using a Shell Cracker on a tulle point, a nice bass swirled on the swimbait, but missed it. As the tide continued to push out, we moved into Rock Slough, but found no action. Finally we caught a couple on weighted senkos on the outside of Mandeville Island. Around 1pm we took a break and had some lunch back at Russo’s Marina. The guy in the small tackle shop told us there has been some chemical spraying going on in order to kill off the vegetation in the water. These areas that were sprayed were definitely lacking baitfish and bass. As the tide started to bottom out, we stayed in Franks Track and focused on fishing the breaks in the levy wall. The wind was blowing pretty well so we stayed on the north side. Using jigs, senkos, and brush hogs, we caught around a dozen fish, with the largest weighing around 3.5 pounds. The water was quite dirty so black and red was our color of choice. The next day I went out alone and launched out of Orwood Marina at around 6:15. With my video camera attached to a tripod in the back of my boat, I had high hopes of capturing some good footage. Flipping a ½ ounce black and red jig, I stick a 5.2 and a 2 pounder right outside Discovery Bay. Then moving south with the tide I make a stop at Coney Island. Fishing a deep hole just out side a big grass flat, I catch a 5.5 pounder on a ½ ounce red spinnerbait. I stuck that fish on my very first cast. Thinking I was about to get into them pretty good, I stayed around that general area for a little over an hour, but catch nothing else. There were plenty of nice healthy weeds and clear water around Coney Island and many other parts of the South Delta. These areas have not yet been chemically sprayed like most of the areas farther north. I then head over to a dead end slough near Rivers End Marina. I spot a 5 pounder with its nose on the bank. Casting a frog up on the shore and then dragging it in, the frog gets smashed as soon as it touched the water. I search for more bass in that dead end slough, but find nothing. Right as the tide started to push back in, I move north to the main channel outside Widow Island. With my new injected Lunker Punker Jr. in hand, I fire a cast to a large piece of wood on a deep rock bank. I work the swimbait a few feet off the bank and then bring it to a stop, a couple seconds later a 7 pounder slurps it off the surface. I fished a couple more areas after that but caught nothing else. Only five bites all day, but I had around 25 pounds of bass. The funny thing is, every fish came on different lures and spots. This time of year that is pretty unusual, especially at the Delta. During the prespawn usually when you find one big fish, you have found a bunch. This was not the case today. Please visit www.russnyders.com for more fishing reports, videos, and info on Northern California Guide Trips. I went out Sunday to take advantage of what I had heard was on off the hook striper bite. Took a buddy from work who had never caught a striper before to get in on the "hot action" as well. The day started well but it ended up being a disappointment. Rand down to Mildred Island and got bumped almost immediately on the Big Hammer but did not hook up. Fished down the bank a bit and I switched over to the Punker and had a fish absolutely destroy it at the very start of the retrieve, he went about 22 inches. about 100 yards down the bank I get another one on the Punker, slightly larger than the first one. After that the wind picked, the sky cleared and the bite died. Spent the rest of the day running to various spots in the central and south delta with no luck. I took my buddy Witold from grad school to the delta today. We had nice condition, with clouds, light wind, etc. It was a little post front by the end of the day but not horrible. Water was 63 degrees, we launched from River's End. Mostly clear water, from 3 to 5 feet. Right off we went in to the mouth of grantline canal and saw like 5 boats fishing striper. I stopped way short of it and we fished down. Saw fish on the graph and Witold caught a 5lb striper on a big hammer. I thought it was going to be a solid day. Instead things turned tough. We fished from 10am to dark and after that first fish sheesh, it was bad. I caught about a half dozen small striper, a half dozen non-keeper largemouth, and of course a bullhead on a spoon. Witold lost one striper. That was it. We saw a few guys get schoolie stripers in grantline on live bluegill, and one on an anchovy. I thought the south end of the delta would be uncrowded but it was the complete opposite. There were boats eveywhere, all day. For bass and striper. We went up to widows and back down coney and it was boat boat boat. There was one spot I wanted to fish by widows and it was a take a number situation with bass boats coming by. At the end of the day we tried to fish the pumps by River's End and I counted 7 other boats in that one stretch. So that was perplexing. July 14th, 2008 - Launched from Rivers End Marina located in Byron California at 6am and fished until 3pm.. Locations Fished - Grant Line Canal, Woodward Canal, Union Point area, Victoria Canal. Catch - 3fish over 3lbs, 8 fish of legal size but under 3lbs, several short fish . Bait - 5" Senco motor oil with black flake, Rebel Pop-R in baby bass pattern and Bomber model "A" in the chartreuse and blue pattern . July 13th, 2008 - Launched from Russo's Marina located on Bethel Island at Franks Tract at 12 noon and fished till 930pm. 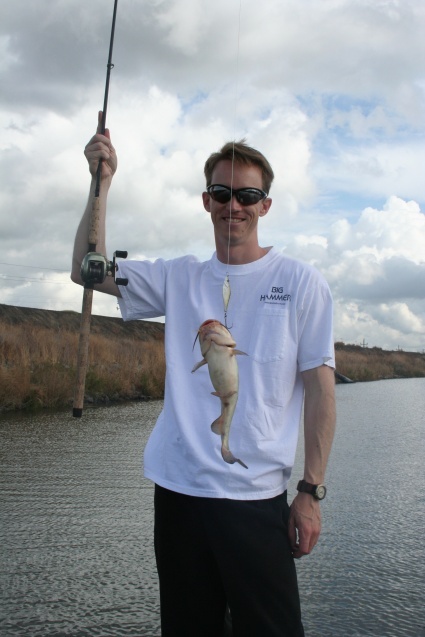 Locations Fished - Franks Tract, Little Franks Tract, Holland Cut Marina area, Discovery Bay. 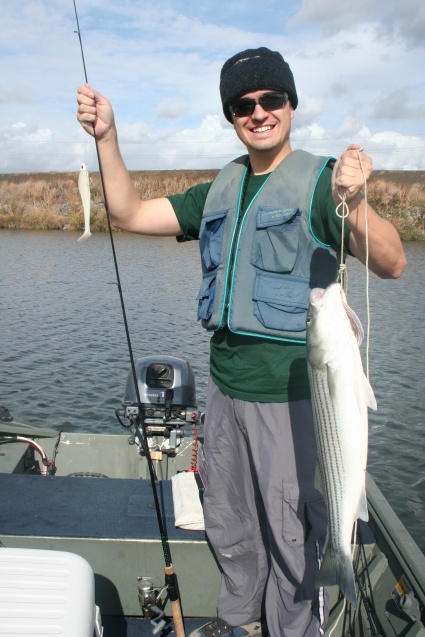 Catch - 9 fish over 3lbs, 14 fish of legal size but under 3lbs, numerous short fish and 5 small stripers. Bait - Bomber model "A" in the chartreuse and blue pattern was the most consistent bait all day and caught all of the fish over 3lbs.